The past two weeks in Houston have been filled with enormous amounts of rain…again. I feel as if we are living in a jungle at this point. My grass is a foot long, but no one can mow it because of the rain! My errands had piled up long enough so I decided to venture out and start checking things off my to-do list. This amazing tote from Veeshee was perfect for holding my umbrella, wallet and all the kids’ snacks. This tote is laminated so I knew it would keep all of my stuff dry as we walked from shop to shop in the sprinkles. Can you believe that I custom made this tote?!?! I was able to pick the type of bag (mine is the Ravenna bag) print, leather, inside material color and add a monogram. Being from the south, if it isn’t moving, monogram it! I picked this vibrant tropical print because we spend so much of our time at the beach, pool and playing outside. 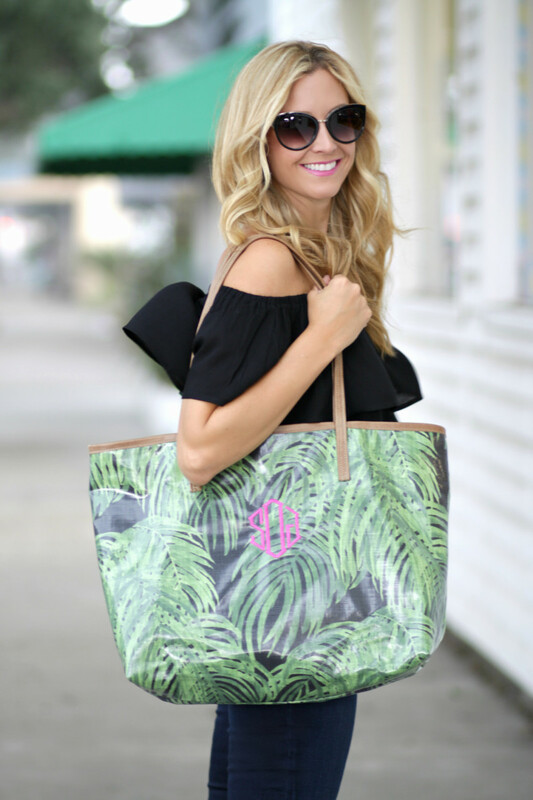 I loved how the hot pink interior fabric and monogram thread color blocked against the green of the palm print. Also, Veeshee totes are handcrafted in the USA. For our rainy day errands I wore this light weight off the shoulder top because it was hot and humid…no pun intended! Really though, look at my hair. It was growing by the second. My husband said at one point he couldn’t even take pictures because my hair was so frizzy!!! How cute is the lace detail on the bottom of this top and the tassel tie? These are my favorite booties from the Nordstrom Anniversary Sale. They are a must for fall and the color is perfection. This is me running under an awning using my Veeshee tote to shield me from the rain. Thank goodness it is laminated to keep me and all of my belongings dry during this monsoon season. you are ROCKING that off the shoulder top and your bag is too adorable. love this!